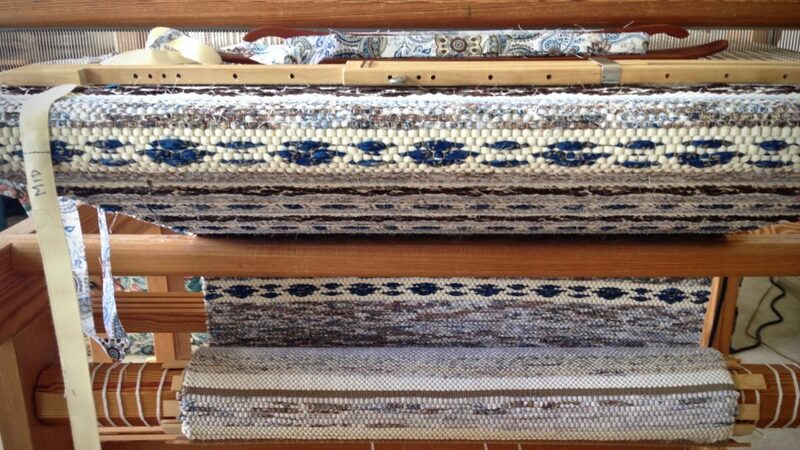 My introduction to rosepath rag rugs was on a room-size loom in Joanne Hall’s magical Montana studio. I was so happy at that moment that I actually cried. It’s no surprise, then, that I relish every opportunity to weave a rosepath rag rug. And even better, to share the joy with other handweavers who may not have tried it yet. Look what came in the mail this week! The March/April 2017 issue of Handwoven, with a project by yours truly–Swedish Rosepath Rag Rug! 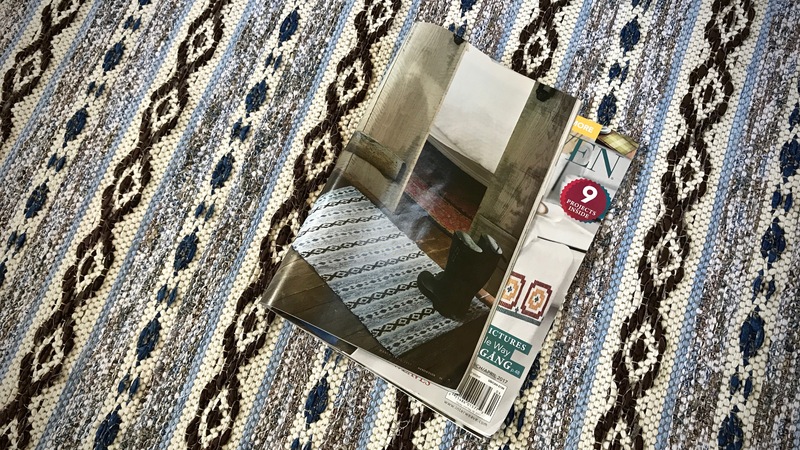 Swedish Rosepath Rag Rug, as seen in March/April 2017 Handwoven. Not everyone loves weaving rag rugs. That’s fine. But if you’re a weaver, there is probably something that draws your interest and brings delight. A certain weave structure, silky fibers, fine threads, complex patterns, bold colors. Something. And if you’re not a weaver, there is something else that triggers your pursued interest. Find that spark that ignites joy in you! 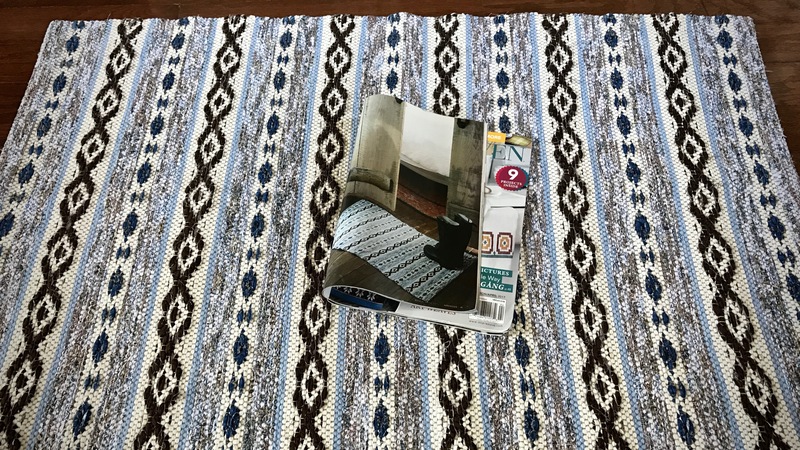 Besides using a pre-measured tape, taking a picture at the beginning of the rug, with the yellow tape measure in view, makes it easy to replicate the hem at the end of the rug. Temple is in place, keeping the rugs a consistent width. Metal rug temples are good, but I still prefer a regular wooden Glimåkra temple for weaving rag rugs. Many rosepath variations are possible. 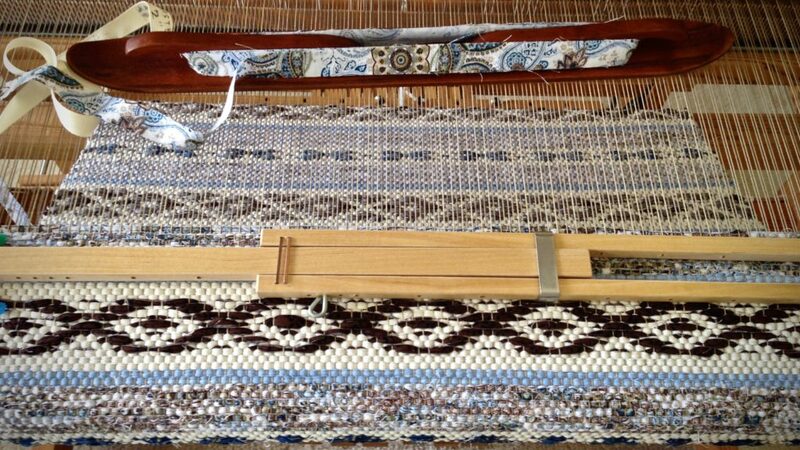 The rug on the cloth beam uses a similar design, with different colors. Making paths of roses. Rosepath. Reverse side of the rug has a subtly different pattern. 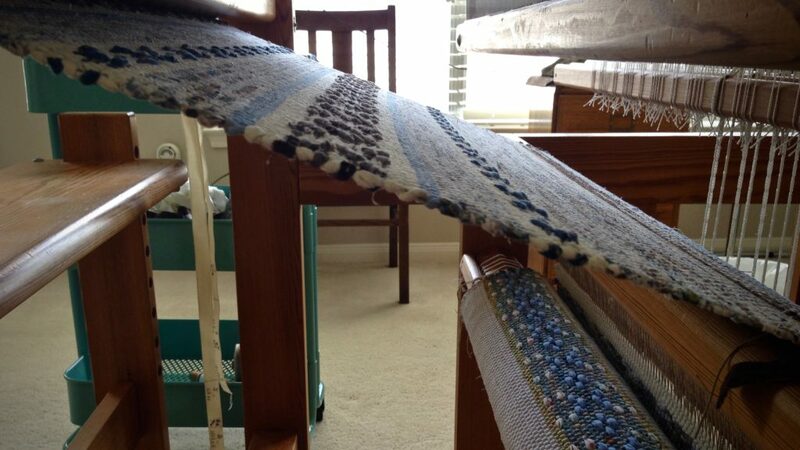 Cloth beam fills up with rag rugs. Pleasant sight for a rag rug weaver! 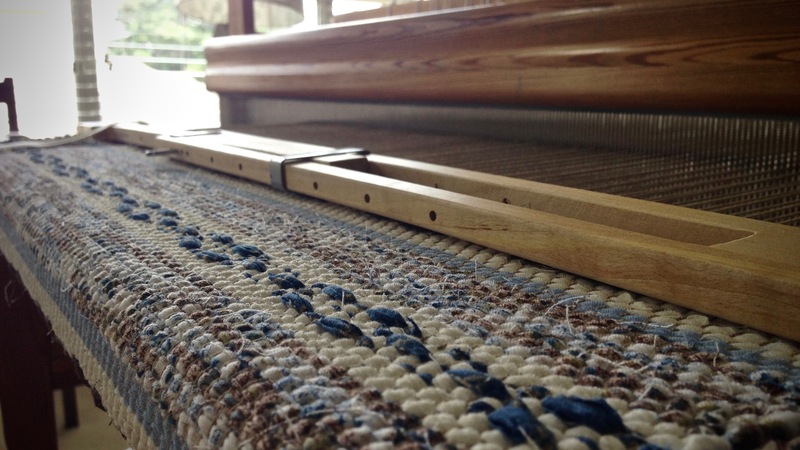 Ending the rug on the loom. Following the markings removes guesswork. Keep a song in your heart. Sing. Sing for joy. Sing praise to the Grand Weaver who put the seed of searching in you. A seed that bursts open with joy when ignited with a spark, and flourishes into something distinguishable. Trust the Lord with all your heart. Your heart will find its melody. Published in March/April 2017 Handwoven. May your heart sing a joyful tune. 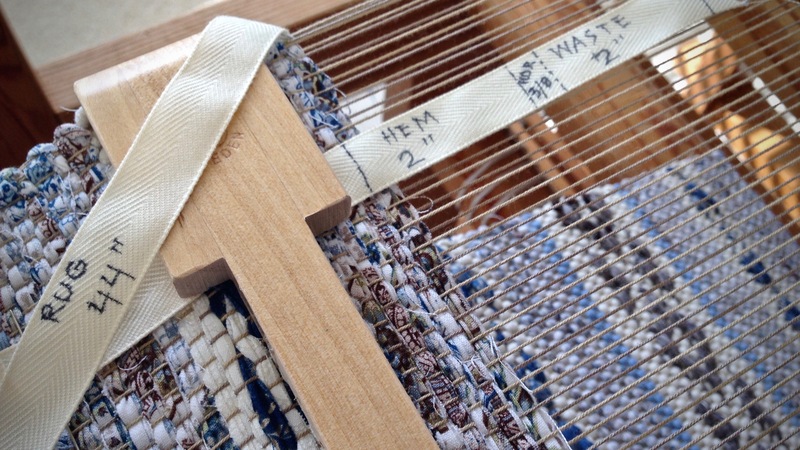 ATTENTION: The draft for the Swedish Rosepath Rag Rug from Handwoven is written for a sinking shed loom. 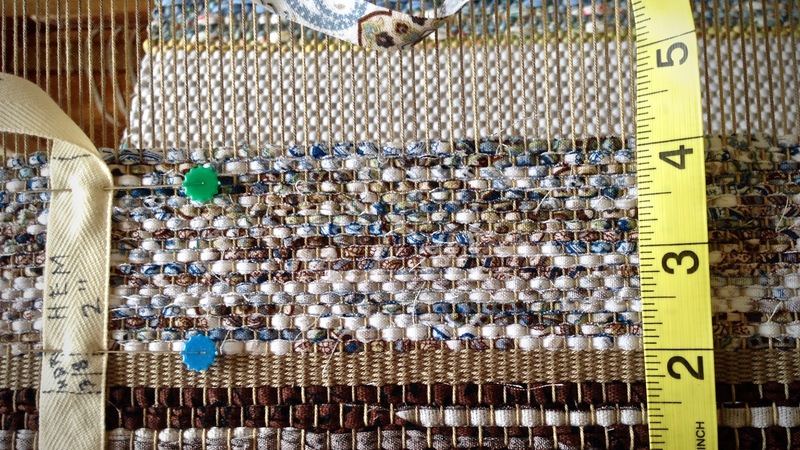 Therefore, for a jack loom, you must tie up the “white” empty squares instead of the numbered squares for the pattern to show right side up as you weave. If you are interested in weaving rag rugs, take a look at Rag Rug Tips, a new tab at the top of the page. Congratulations, Karen, on another beautiful article! Beth, Thank you so much! I’ve just done my first rose path rug and I loved doing it. Used tee shirt yarn from my stash. Yours is gorgeous and I can’t wait to try it. You also have some great suggestions — I love the photo idea for the hem. Much better than my notes. Hi Maggie, Rosepath is so much fun. I’m glad to hear you have enjoyed it, too. Yes, the photo has saved me many times. My memory and my notes are not that great. I downloaded Handwoven yesterday, and was pleasantly surprised to see your rug! Congratulations ! Hi Janet, That’s wonderful that you want to give it a try! Let me know how it goes. Hi Sandy, Sounds like you have me figured out. 🙂 Isn’t it exciting to get a weaving magazine in a pile of mail? Everything else has to stand still while I flip through the pages. And then, later, I sit down with it and read every page. Thank you for your wonderful encouragement to me. It means so much! Don’t you just love her!! Beautiful job on your rug! Mary, If you are referring to Joanne, Yes! She is one of my very favorite people. Congrats. Need to run out and get a copy of Handwoven. Hi Carol, Thank you! You’ll find several great projects in this issue. My issue of Handwoven arrived yesterday and I was thrilled to see your article! Beautiful rug and I’m so looking forward to trying this. And checking out your tab of tips – I’ve never woven a rag rug before (I’m a fairly new weaver), though I’ve dreamed about it. I can use all the help I can get! Hi Sandy, You’re in for a treat. 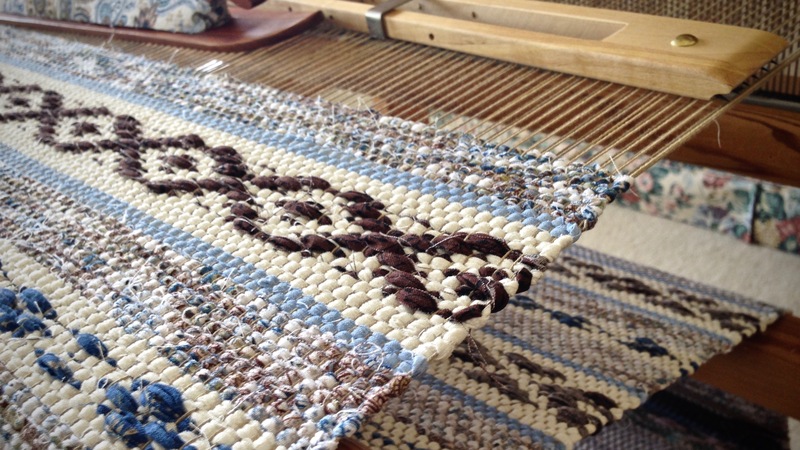 Weaving a rag rug is different than other types of weaving. You get to use some muscle! 🙂 Please let me know if you have any questions, or if I can help you in any way. Nanette, I’m happy the measuring ribbon works for you! One of the places I learned about using a ribbon for measuring was at Vavstuga. So many little things can make a big difference. Karen, it was wonderful to see your work recognized in Handwoven! What a well deserved honor! Your work is beautifully striking and so is your testimony to our Lord. May He who is the master weaver continue to bless your endeavors as you continue to serve Him. Dear Bonnie, Your thoughtful words are received with immense gratitude. You have touched my heart. 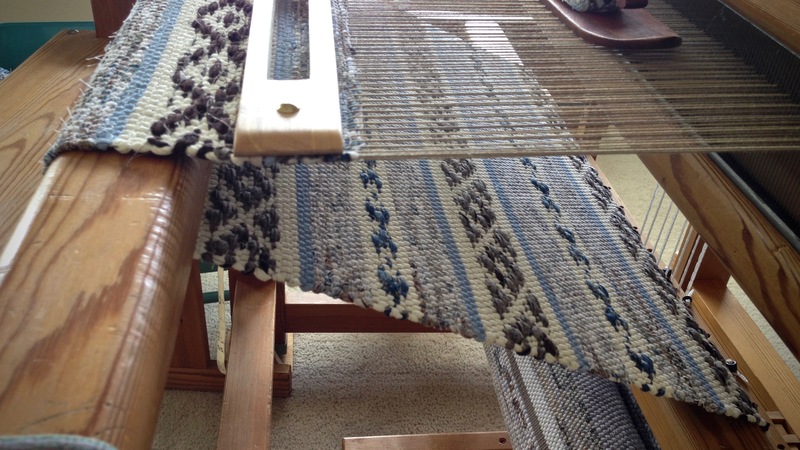 Karen, thanks for submitting your article to Handwoven. I fell in love with your rug when I first saw it and it totally changed my mind about rag rugs. Just finished my first rag rug using your instructions and can’t be happier. Thanks heaps! sewTreefrog, I am thrilled to no end that you had a great experience weaving this rag rug! Thanks so much for letting me know. I see on your blog that your rug came out beautifully, with lovely contrast in the colors.